GameSpree, publisher of free-to-play browser games has just announced the release of Update 1.4 “The Reckoning” to Kings and Legends, the unique strategy/TCG, free-to-play browser title. 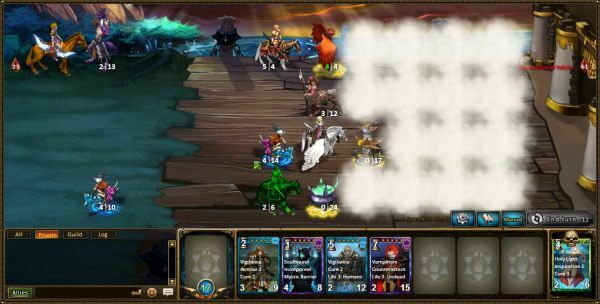 The action unfolds in this latest update featuring two exciting new card races: Dragons and Angels. The Reckoning is an expansive 3-part update that adds a host of Dragon and Angel cards that players can collect through new events. Divinity’s Tower: Adds a new element to the popular Ascension Tower; a colossus of 50-levels of challenges. Now you can face the might of the Heavens and earn points to redeem on collecting Angelic cards; these great support and utility cards help control the battlefield with Healing abilities and great Area of effect spells to stall your opponents advance. Man the battlements: City-Defense is a brand new Game mode pitting players against each other in assault-style battles. Hide units in a Fog of War and devise cunning ambushes, or take the fight to the enemy and complete Quests to discover Rune-formulas! These powerful pieces of equipment can now be forged and add another layer of strategy to a battle! In addition to all this base-content, GameSpree is steadily and consistently releasing its own inspired and exclusive cards available only in Kings and Legends. “Long-term motivation and balancing is a key focus of our plans to develop the game experience even further, identifying opportunities for new unique cards and tactics to make Kings and Legends more exciting than ever!” said Thorsten Russ, Lead Producer. Weekly Recap #269 Dec. 14th - Gigantic, Crossfire, First Assault & More!